Hundreds of children kicked off an exciting Purim season at Chai4ever’s spectacular Pre-Purim Carnival. Amidst the frenzy of last-minute Purim preparations, parents burdened by the stress of illness carry a doubled load. This year, they had the luxury of leaving their children in the capable hands of Chai4ever’s loving volunteers for a memorable day. 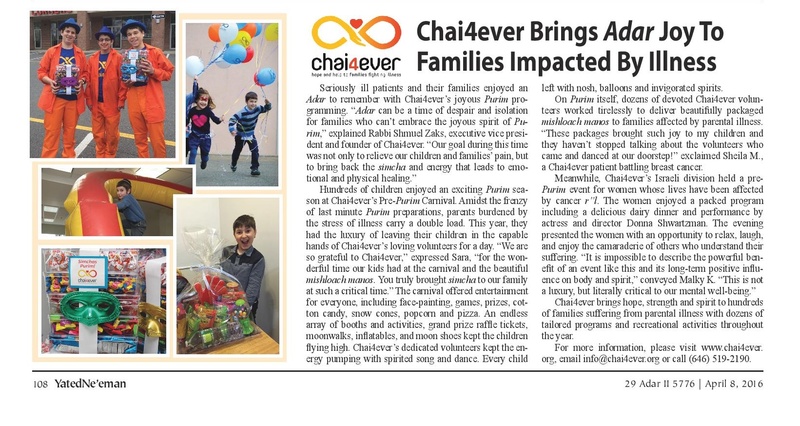 “We are so grateful to Chai4ever”, expressed Sara, “for the wonderful time our kids had at the carnival and the beautiful mishloach manos. You truly brought simcha to our family at such a critical time.” The carnival offered entertainment and amusements for everyone including face-painting, games, prizes, cotton candy, snow cones, popcorn and pizza. The endless array of booths and activities boosted the excitement by awarding Grand Prize Raffle tickets. Moonwalks, inflatables, and moon shoes kept the children flying high. Participants were impressed by Chai4ever’s dedicated volunteers who kept the energy pumping with spirited song and dance. Every child left with nosh, balloons and invigorated spirits. On Purim itself, dozens of devoted Chai4ever volunteers worked tirelessly to deliver personally selected and beautifully packaged mishloach manos to families affected by parental illness. “These packages brought such joy to my children and they haven’t stopped talking about the volunteers who came and danced at our doorstep!” exclaimed Sheila M., a Chai4ever patient battling breast cancer. The joy the packages brought to patients and their children was eclipsed only by their excitement at the singing, dancing and merriment that the volunteers brought with them wherever they went. 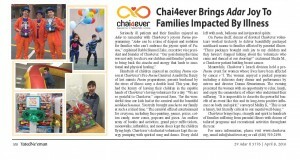 Chai4ever brings hope, strength and spirit to hundreds of families suffering from parental illness with dozens of tailored programs and recreational activities throughout the year. For more information, please visit www.chai4ever.org, email info@chai4ever.org or call (646) 519-2190.